An aerial view of the site of Blue Origin's new facility, where the company will manufacture, process, integrate and test its orbital vehicle, unofficially referred to as Very Big Brother. Jeff Bezos is building a home for his Very Big Brother. The Amazon.com founder and CEO's private spaceflight company, Blue Origin, has stepped into the spotlight this past year thanks to dramatic videos that show the organization's New Shepard suborbital rocket launching and then making perfect vertical landings. Just this month, Blue Origin presented a webcast of one of those landings, which was the very first live broadcast of the dramatic event. 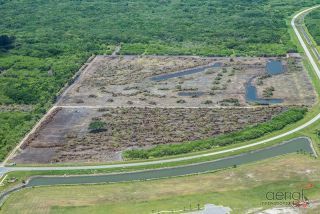 Preparation begins at the site of Blue Origin's new orbital rocket facility in Florida. "The 750,000-square-foot [70,000 square meters] rocket factory is custom-built from the ground up," Bezos wrote. "It's exciting to see the bulldozers in action — we're clearing the way for the production of a reusable fleet of orbital vehicles that we will launch and land, again and again." An artist's rendition of Blue Origin's new Florida facility, where the company will manufacture and test orbital rockets. Bezos' email included images of the site and artists' renditions of what the completed facility will look like. The company is aiming to have the facility complete in December 2017, Bezos said. He announced, in September 2015, that the company will launch rockets and spacecraft from Launch Complex 36 at Cape Canaveral Air Force Station in Florida. "All of the vehicle will be manufactured in this facility except for the engines," Bezos wrote. Blue Origin's orbital rocket will be powered by the company's BE-4 engine. The company has also entered into a contract to sell the BE-4 to United Launch Alliance (ULA), one of the nation's most veteran space-launch providers, for that company's next-generation rockets. A wide view of the artist's rendition of Blue Origin's new Florida facility, where the company plans to manufacture and test orbital rockets. "Initial BE-4 engine production will occur at our Kent [Washington] facility, while we conduct a site-selection process later this year for a larger engine-production facility to accommodate higher production rates," Bezos wrote. Blue Origin has said it will sell space on the suborbital New Shepard vehicles for scientific experiments, as well as space tourism. The suborbital trips will last for a matter of hours, and passengers (or cargo) will experience weightlessness for a brief period.